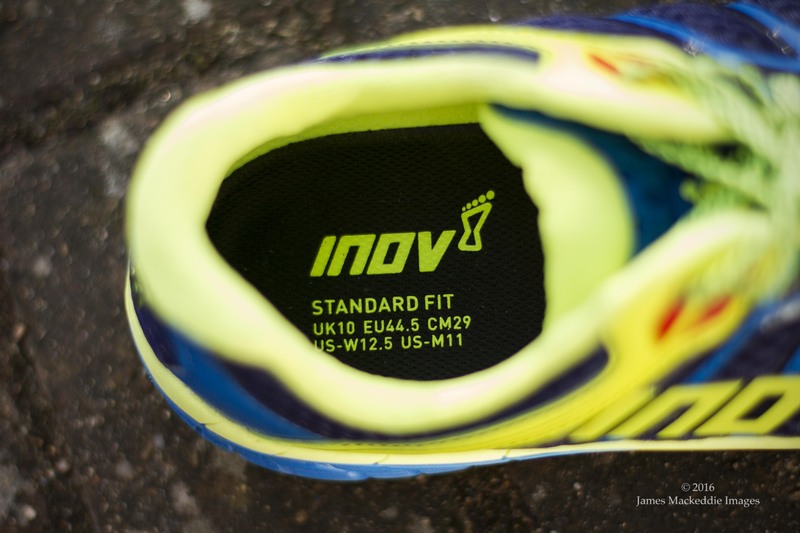 inov-8 exist to enable you to take on any terrain. Their comprehensive line of trail/fell shoes and expansion into cross fit/gyms, had most bases covered. However, the roads were a little lacking of options. Its true they have the X-Treme™ range, but these low drop, ultralight shoes favoured the biomechanically efficient over shorter distances. But times have changed. Earlier this year, inov-8 announced the RoadClaw™ 275, taking their grip from the trails onto the road. Rather than stopping short by delivering what the established road competition already had, they have looked at what they know best. Creating a road shoe that grips to anything and everything. The outsole is relatively aggressive, the compound is soft and the upper will protect you from debris. Outside of the yellow detailing which immediately captures your eye, the area that caught my eye next was the reflective areas. Shaped like claws or talons, they exist on the heel and toe box, they are fitting of the name. The upper mesh is pliable, soft and keeps debris at bay. Though it looks substantial, it isn’t in the hand and breaths well. Furthermore it looks like it’ll take some abuse, for all those misjudged time you drop down off a kerb dodging a post or person. 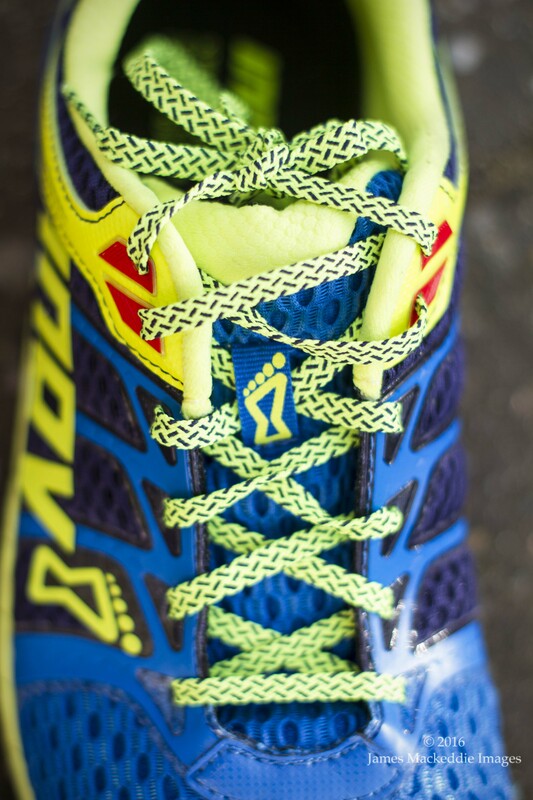 The flat laces lock well and never had a slipped or loosened on longer runs. The side weld overlays wrap the shoe around your foot, and though you can wiggle your toes as much as you want, the remainder of your foot remains secure. Using the same mesh, the tongue isn’t noticed which is perfect. Not too long, too thick, irritating. It does its job well and hasn’t caused any issues. Cupping your heel, the heel cup is supportive without being restrictive, much like the rest of the shoe. It hugs your heel in a soft cushion, with no hot spots. The best way to describe is that it works with you, rather than against. It’s pliable and rolls with the ankle, yet the overlays provide structure, stopping it before a loss of function. As mentioned earlier, you can wiggle your toes all day long. 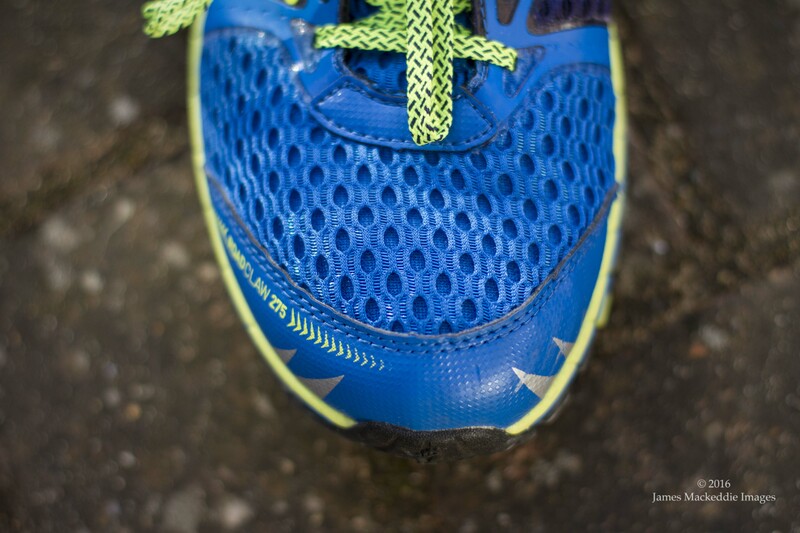 The toe box is wide, but not so much things get sloppy when you’re running in the rain. 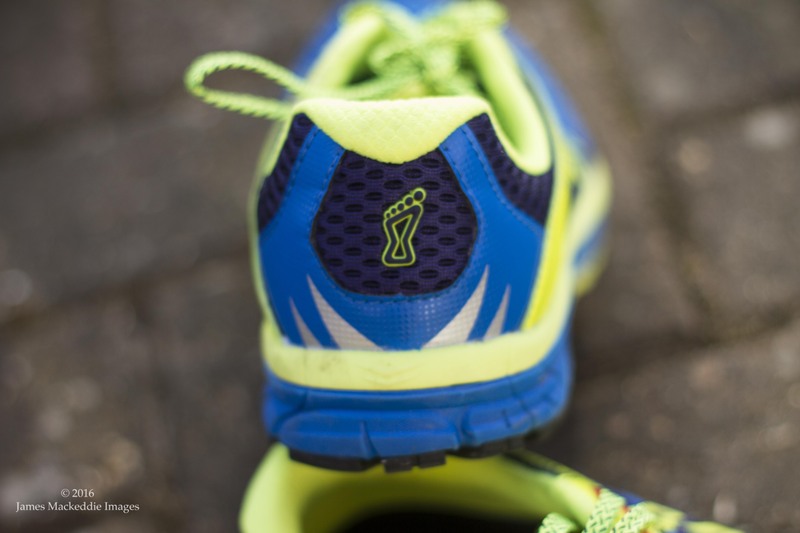 This also means no pinching or hot spots and it’s refreshing to have a wider toe box for those longer runs. So the top – breathable, comfortable and durable. It’ll be interesting to see how it stands up to the next few months, but in short, it’s a goodun. 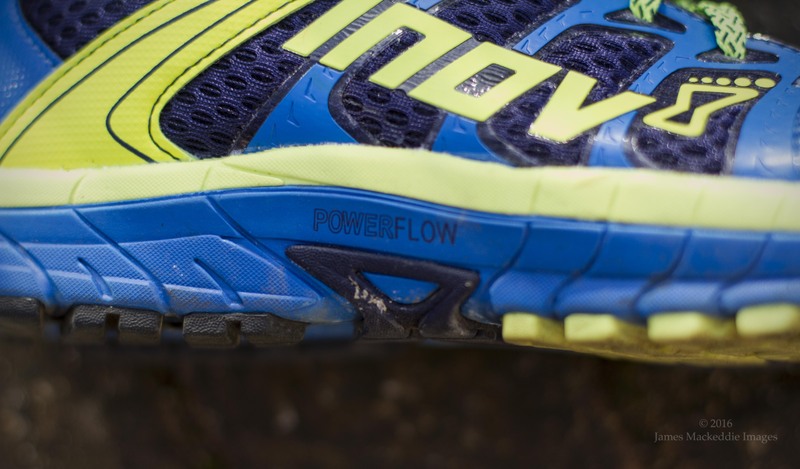 Moving down, the midsole is constructed from inov-8’s Powerflow™, which is claimed to provide 10% better shock absorption and 15% better energy transfer than their standard midsole. In practice, it’s a very comfortable, soaking up a lot of vibrations rock hard surfaces send through your legs. At the same time, the ride never felt numb or dead. Even when opening up the taps on speed sessions, they respond, aiding propulsion and keeping you headed forward. 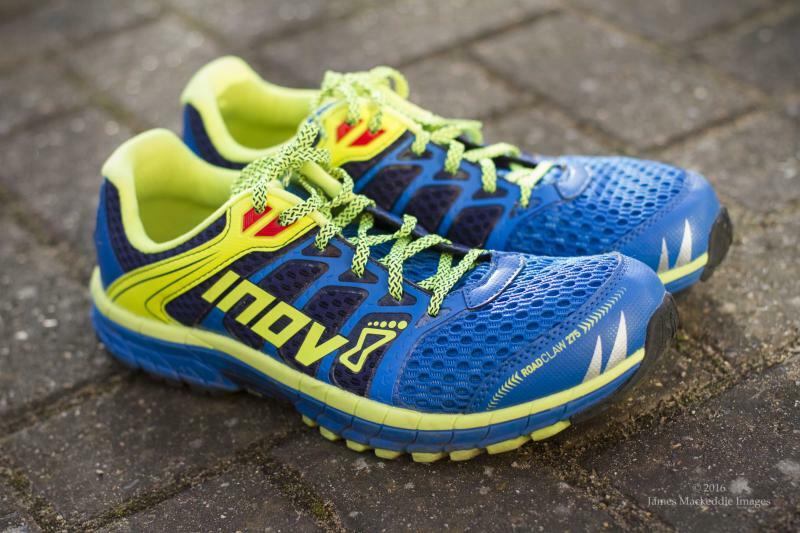 Now, inov-8 aren’t renowned for soft, plush midsoles. Given their fell heritage, it has only been in recent years with the Race Ultra that this has started to infiltrate designs. But the Powerflow™ used in the RoadClaw™ 275 is a cracker and whether taking a steady 3 miles or pushing on a 10 mile tempo run, it soaked up the shocks. So the grip. This is where the RoadClaw™ excels. Taking the brands fell and trail heritage, the compounds used on the outsole stick like glue when required, yet don’t impede when moving fast. The best way to describe would be like a road cycle tyre, a soft durable compound with excellent grip in all conditions, yet, also has a low rolling resistance, meaning less effort needed to keep it moving. The TRI-C outsole is soft and supple to the touch. It wears well, after 50 or so miles I am starting to see the exterior lugs on the lateral side begin to show the early signs of wear. 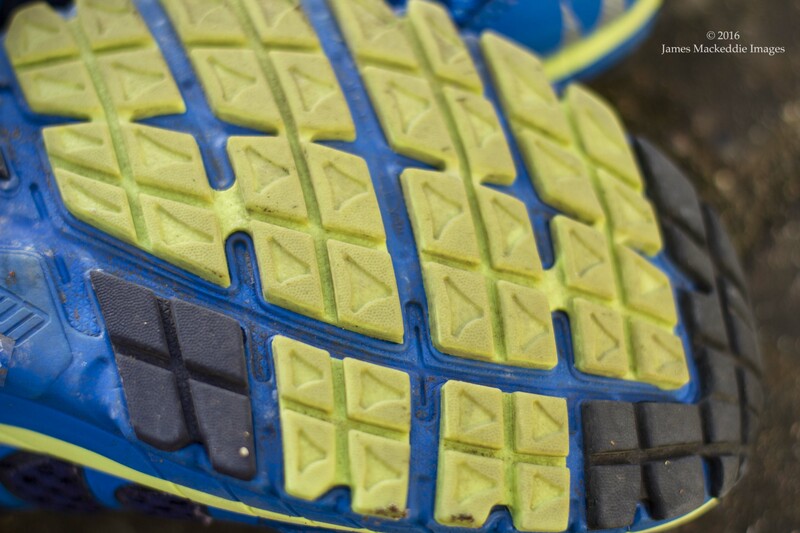 The compound and tread is consistent throughout the sole of the shoe and therefore the gait cycle, allowing for dependable grip. inov-8 incorporate a variety of shanks in their shoes, and the RoadClaw™ contains the Dynamic Fascia Band™, designed to give you a kick with every step, supposedly to mimic the windlass effect. Though you can’t feel it, you know this is no couch potato when you kick it up a gear. With an 8mm heel /toe drop, its great for those longer distances or those who require more of height and support. I don’t think it would benefit from going any lower and combined with the standard fit, great for the wider foot, it gives a well balanced, stable platform to eat up miles on. It’s good looking, comfy and can keep up when you go for that PB on our less than perfect network of roads and paths. But is that everything? Personally, I think they could make the shoe look a little more aggressive, as the styling in my eyes has more in common than the F-LITE™ range, rather than trail and for me the trail wins stylistically. I also feel the outer lugs could benefit from a different compound which may stand up to wear better. Wear vs grip is always a fine line and its easy for me to make suggestions. Designers, throw your two pennies in! The RoadClaw™ is a shoe you can take on your local park run or to the streets of London or Boston to soak up 26.2 miles in rapid succession. Hey, for the gnarly road runners out there, Commrades may even be a great shout! Delivering a shoe that can perform, protect, provide comfort and not feel like a lead weight is a challenge, and it’s a challenge they have won with flying colours. Just give me more colour options! 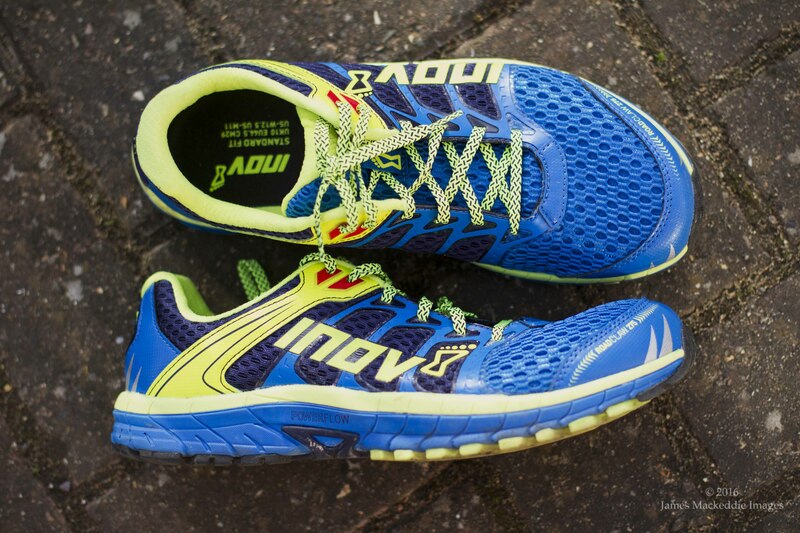 For more info on inov-8 RoadClaws CLICK HERE!